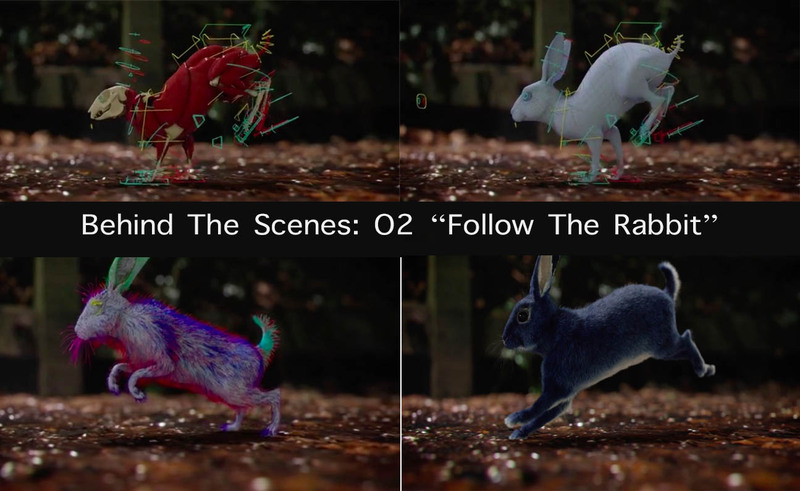 The Mill created this follow-up to O2’s ‘Follow The Rabbit’ campaign, with not just one fully CG photo-real wild rabbit, but thousands. This latest film sees the return of the iconic blue rabbit, but multiplied in abundance. 3D Lead Artist Alex Hammond explains ‘This was a huge job for the Mill and one that required an extensive team of artists. We rendered a total 1560 rabbits with the maximum number of rabbits involved in one shot coming in at around 820. 3D Artist Sid Harrington-Odedra provides further details about the creation of the magical tunnel, explaining ‘The directors (dom&nic) were both very clear that the portal needed to be entirely believable and not exist in the world of science fiction, but rather be built as though it were an installation in a modern art gallery.